"I still got a long walk ahead of me." That's a great quote from Joe Alwyn in Billy Lynn's Long Halftime Walk, a brilliant film about the cost of war. The film is based on the 2012 novel of the same name by Ben Fountain. Set in 2004, Alwyn plays Billy Lynn, a soldier serving in the Iraq War, who has become famous for a video that showed him saving his troop from a battle in Iraq. Billy & his troop are celebrated as heroes & are sent back to the United States for a victory tour, culminating in a halftime show featuring Destiny's Child during a Thanksgiving Day NFL game in Dallas. 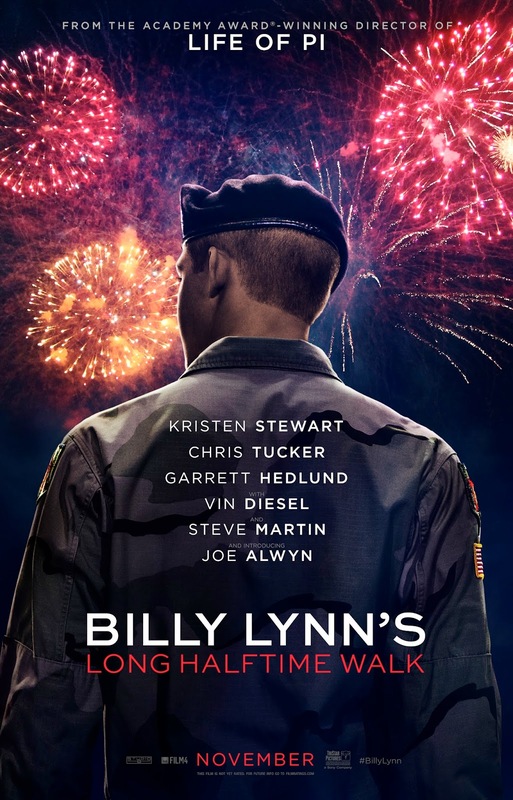 While home, he reunites with his family; however, his sister, Kathryn (played by Kristen Stewart) is upset, knowing he will return to Iraq after the victory tour, & she tries to get him to open up, but Billy says that he is fine. During the victory tour, the troop, led by Sgt. David Dime (played by Garrett Hedlund), also buries their former leader, Virgil "Shroom" Breem (played by Vin Diesel), the only member of the troop they couldn't save. At the game, they are met by Albert (played by Chris Tucker), an agent who is trying to get a film made about the troop, & by team owner Norm Oglesby (played by Steve Martin). Billy also falls in love with Faison Zorn (played by Makenzie Leigh), a team cheerleader. During the game, Billy has flashbacks about the war, & realizes the tragic truth of war, not just on the battlefield, but at home as well. The cast was excellent, especially newcomer Joe Alwyn. Ang Lee's direction is amazing, with this being one of his best films yet. Jean-Christophe Castelli's screenplay is excellent. John Toll's cinematography is stunning. And Tim Squyres' editing is great. This is one of the best films of the year, showing the sad truth of what happens when our veterans come back home, for we praise them when they're fighting a war, but when they come home, we don't do enough for them.